We’d love your help. Let us know what’s wrong with this preview of Letters to a Young Artist by Anna Deavere Smith. To ask other readers questions about Letters to a Young Artist, please sign up. This was a challenging, motivating book. Smith has written it in the form of a series of letters to an imaginary young artist named BZ, who ostensibly won her mentorship in an auction. The letters are meant to offer BZ encouragement to pursue a life in the arts. Smith offers inspirational advice about the civic applications of art, and how it can reveal to audiences a new way of dealing with their own emotions and therefore viewing the world, as well as practical advice about staying hydrated, l This was a challenging, motivating book. Smith has written it in the form of a series of letters to an imaginary young artist named BZ, who ostensibly won her mentorship in an auction. The letters are meant to offer BZ encouragement to pursue a life in the arts. Smith offers inspirational advice about the civic applications of art, and how it can reveal to audiences a new way of dealing with their own emotions and therefore viewing the world, as well as practical advice about staying hydrated, letting the image of the sickly starving artist go, forming a community of interdisciplinary membership, and talking without fear to The Man, whomever that may be. For my "West Wing" loving heart, there was a small section of the book where Smith writes to BZ about getting offered a role on the show that she would end up taking, and in which I admire her greatly. After "The Artist's Way," which I thought was patronizing and saccharine, "Letters to a Young Artist" is refreshing. It's full of tough love, direct advice, useful anecdotes, and plain old inspiration. Smith writes as a teacher and an established, famous artist, but she also writes about not nailing auditions and not getting awards and not knowing how long any given job will last her. The book also has an appendix of resources for artists seeking grants and community. I'm a sucker for nuts and bolts, what can I say. A loosely organized collection of musings on working in the arts. The tone struck me as being very much born from a woman who has "made it" and gained so much respect and success in her career. So there are plenty of gems. But there are just as many asides about lunch with the rich and famous and references to the most impressive highlights on her resume. For a book purported to be so focused on putting art into the hands of a young artist, it made the art world seem completely unattainable. Bey A loosely organized collection of musings on working in the arts. The tone struck me as being very much born from a woman who has "made it" and gained so much respect and success in her career. So there are plenty of gems. But there are just as many asides about lunch with the rich and famous and references to the most impressive highlights on her resume. For a book purported to be so focused on putting art into the hands of a young artist, it made the art world seem completely unattainable. Beyond the great and occasionally poignant insights on confidence, self-esteem, and creation, most of the concrete advice I absorbed was 1. move to New York and 2. be well-connected to lots of other famous talents. I found myself wanting more substance, even more personal anecdotes from her obviously fascinating life. It ended up feeling like a mix between a watered down memoir and a self-help book. I just finished reading this but could already reread it. There's something to words presented as letters that has great appeal to me. Smith's writing is warm, thoughtful, direct, with sprinkles of tough love. It's also a glimpse into her I just finished reading this but could already reread it. There's something to words presented as letters that has great appeal to me. Smith's writing is warm, thoughtful, direct, with sprinkles of tough love. It's also a glimpse into her life, travels, and thoughts on events occurring as she wrote the book. One of the best books for those creative souls who are seeking non-management advice on their careers and life in general. i like this book. there are small gems and it can be the pep talk when you can't give it to yourself. I saw this book in Borders last night and read half of it in one sitting. (I'm going to have to go back and read the other half soon). It would make a great bathroom book beacuse it is organized as a series of short letters, some no more than a few words. Parts that jumped out to me: ADS talks about presence and what it is to have it. In her opinion it means being aware and engaged. People who are the most compelling are the ones who are interested in other people. This seems counterintuitive to I saw this book in Borders last night and read half of it in one sitting. (I'm going to have to go back and read the other half soon). It would make a great bathroom book beacuse it is organized as a series of short letters, some no more than a few words. Parts that jumped out to me: ADS talks about presence and what it is to have it. In her opinion it means being aware and engaged. People who are the most compelling are the ones who are interested in other people. This seems counterintuitive to me: that what draws attention is giving attention. Etymologically I can see the connection though, presence requires being present. ADS says all of this in a more succinct and interesting way so even if my description doesn't float your boat, the book is still an interesting read. 3.5 - I really wish there were half stars. 04/16/08: Just finished. Another part that interested me was ADS' recommendation to her students in the wake of a school tragedy. A number of the students felt alienated and she suggests that they "try to suspend their personal feeling of alienation and look instead for alienation in others and offer consolation when they see it". Her advice for procrastination is to jump into the task immediately, before you can even think about putting it off. Since reading that I have experimented with that and I have to admit that it works. "So the death of cool... would do what? It would probably bring more tones, more color, more emotion, more love, more raw spirit, more argument, more energy. More authenticity? More compassion? More laughter? More tears? More open hearts? Try it. Be uncool. As uncool as you can possibly be. Write to me about the result. I wrote out the whole part because besides loving the sentiment I like the rhythm to the way ADS wrote it. I have wasted a lot of time chasing "cool" and other norms. It is empowering to have someone saying to risk life on my own set of terms. I also appreciated her discussion on why the artist does not have to suffer (her point: doctors don't have to have every disease they treat, bakers don't eat every cake they make...) to make art that is of value. I struggle with the fear that most art, art without a political spin, is trivial. But, this book offered me the idea that there is value in having a unique perspective on the world and communicating it. That it is enough to be alive and interested in the world and asking questions about it. That those questions and investigations have equal value with the questions being explored in other fields. And for this I am truly grateful. I'm a fan of Anna Deavere Smith. I enjoyed this book and would rate it 3.5 if I could, it's a quick read with each chapter a written response to a young artist (it is called fiction, but it sure feels real reading it). The information in it is not new, but I like how she puts pieces together and throughout the book she gives the reader ideas to keep one's spirit up about the work of creating art. One section titled Find Your Twin, she gives the task to do this very thing and says, " These are th I'm a fan of Anna Deavere Smith. I enjoyed this book and would rate it 3.5 if I could, it's a quick read with each chapter a written response to a young artist (it is called fiction, but it sure feels real reading it). The information in it is not new, but I like how she puts pieces together and throughout the book she gives the reader ideas to keep one's spirit up about the work of creating art. One section titled Find Your Twin, she gives the task to do this very thing and says, " These are the exchanges through art that make the world seem manageable." I identify with this and her story of finding a Brazilian dancer who she totally felt was her spiritual twin. In the chapter Auditioning, Selling Your Wares, she compares the artist to clowns. "Clowns are always working in relation to authority. Authority is no-nonsense, but the clown is tireless, always trying for, wishing for, approval. It's hard to be a clown. To wish for approval is to make oneself vulnerable. Clowns are tough, ultimately. They have to outsmart the nonchalant ones around them, and at the same time endear themselves to the audience, the ones in charge." She sees the artist as the outsider who comments back, and the importance of this role "as a platform from which you seduce others, while at the same time you have to do what it takes to get the job." In the chapter Your Name, Your Fame she says, "...the need to be heard is not enough. To be heard is only part of the engagement. To develop a voice, you need to develop an ear. To develop a vision you need to develop an eye. To develop your mark as an artist, you need to see the marks of others—especially the marks of those who are unrecognized. Everyone around you is making a mark of some kind." I love these equations, they are so ordinary yet make so much sense. In the section on Stage Fright she talks about the tremendous energy it takes to put yourself into the public, and about the term Diva. Why the backstage is such a potent place, it is where the show is nurtured, hence the flowers, the food, the place of safety to come from and to from the on stage presence. An upbeat book that inspires. An absolute confirmation of what any artist with a shred of sincerity knows to be true. Stated in warm, human letters written to a teenager. these short chapters are affirming and enlightening at any age. After 20 years as a professional musician, working often in experimental areas, I can say this all applies to us too. Certain issues return at every stage: searching for a balance of paying the rent and taking risks, managing authority, and staying on track with just doing the work, to name a f An absolute confirmation of what any artist with a shred of sincerity knows to be true. Stated in warm, human letters written to a teenager. these short chapters are affirming and enlightening at any age. After 20 years as a professional musician, working often in experimental areas, I can say this all applies to us too. Certain issues return at every stage: searching for a balance of paying the rent and taking risks, managing authority, and staying on track with just doing the work, to name a few. "Are you becoming an artist because you want the world to look at you? Or Are you becoming an artist because you would like to use your ability to attract attention-- and the ability to get people to look at your work--in order to cause them to see themselves and the world differently through you?" Each letter is written on a topic like "Presence" "Confidence" "Procrastination" Trust" "Jealousy" "Fear" "Empathy" "Urgency" and "The Death of Cool" . Each gets to the heart of one or two core issues. For years I have liked the way Anna Deavere Smith says what she says; I like her perceptions and her take on it. She is one of the most inspiring artists working today, and I would encourage anyone in any field to read her work, but especially artists/performing artists and anyone looking for energy to speed you on your path of commitment to changing society for the better. This book is another example of an artist being healthy, hard-working, intelligent, full of vitality and awareness. "He must be in his mid-sixties, and he is in perfect physical shape. He was standing by the bar, and I asked him not about the film but about his physique. Actress, MacArthur fellow and Professor Anna Deavere Smith's performance at the North Carolina Literature Festival was one of the most astonishing I have ever seen. She has interviewed hundreds of people, famous and not, who do meaningful work with their lives or who have lived through life-changing or life-shattering experiences or both--a privileged white doctor witnessing the humanity and inhumanity at Charity Hospital after Katrina, a victim and survivor of the Rwandan genocide, Texas Govern Actress, MacArthur fellow and Professor Anna Deavere Smith's performance at the North Carolina Literature Festival was one of the most astonishing I have ever seen. She has interviewed hundreds of people, famous and not, who do meaningful work with their lives or who have lived through life-changing or life-shattering experiences or both--a privileged white doctor witnessing the humanity and inhumanity at Charity Hospital after Katrina, a victim and survivor of the Rwandan genocide, Texas Governor Ann Richards prior to a procedure to treat her esophageal cancer and many more--and then she embodies them--body and soul-- powerfully onstage. This slim volume, written in epistolary form to a young artist she calls BZ, is full of ADS's wisdom, insight, empathy and toughness, as she advises the young woman how to make her way in the creative life. Ignore the title; it is for artists and creative people (i.e. all people) of all ages. Only wish it had been longer. The joy of being there, of doing it, enjoy what you do, zelo všeč!! BE MORE THAN READY, BE PRESENT IN YOUR DISCIPLINE. REMEMBER YOUR GIFT. CHERISH IT. TAKE CARE OF IT AND PASS IT ON TO OTHERS. a pragmatic and inspiring mentor is available to all young artists in the form of anna deavere smith. included are letters to "bz" spanning from the 90's to 2000's. her final advice is most powerful. "through discipline, you can learn how to absorb the complex, and to translate it simply... stay strong, stay you, stay new". as a text alone this is great, but her real talent and presence as a performer shines in the audiobook performance, so i recommend it in that format if you can get it. I first read “Letters to a Young Artist” in 2013. I had signed up for a college level theatre course at my local high school, and this was one of two books required for the course. Once Smith’s book arrived at my house I dived in and did not stop reading until the pages were marked from top to bottom and I had memorized nearly everything that she had said. This is definitely a book for anyone who wants to be or would consider themselves an artist. this is a good antidote to the romantic solitude you find in rilke's "letters... (see my review of rilke in my booklist)" ADS is very refreshing and i did come away with some practical advice. although i have to say that a good bulk of what she writes seems like something i would have needed to read five or ten years ago. This is one of the best books I have ever read on preparing for and working in the arts. Anna Deavere Smith tells us such perfectly fundamentals things for living that we have completely forgotten, having presence, paying attention, developing discipline and listening to those around you. The thing I learned that I most appreciate - be prepared. Read it whether you work in the arts or not. Very good advice for creative people. Anna Deavere Smith has pithy observations about life, great stories about her life as an artist, and sets forth a very clear idea of what it means to be an artist and interact with the world. This was a very comforting and reaffirming book. Good book and good, practical, advice into the life of an artist, what to expect, what to do, etc. The fact that it's written in the form of letters is a big bonus. This book was recommended by Jodi, a fellow Goodreads participant who is also an artist. 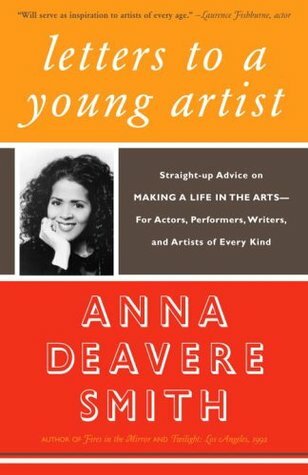 Anna Deavere Smith writes to a fictional young artist regarding issues relative to working in the arts. Affirming and helpful. i loved 'fires in the mirror' and perhaps approached this book with too high of expectations. the introduction was absolutely inspiring and there were some good sound-bites throughout- but i just couldn't get into it. I love books that talk art and the making of art and do it in a way that inspires people to get out there and start working. This book has given me ideas to bring into the various writing classrooms I find myself in. I believe this book should be required reading for all artists and those who wish to be artists of some sort. started this for inspiration. some of it i agree with, some i'm like, woh that is totally out of left field. taking it with a grain of salt. Anna Deavere Smith (who plays Gloria Akalitus on Nurse Jackie) writes letters to an aspiring young artist with honesty, joy, frankness and hope. A timeless read. This book got me through my college auditions. I will never be without it. Anna Deavere Smith (born September 18, 1950) is an American actress, playwright, and professor. She is currently the artist in residence at the Center for American Progress. Smith is widely known for her roles as National Security Advisor Nancy McNally in The West Wing and as Hospital Administrator Gloria Akalitus in the Showtime series Nurse Jackie. She is a recipient of The Dorothy and Lillian G Anna Deavere Smith (born September 18, 1950) is an American actress, playwright, and professor. She is currently the artist in residence at the Center for American Progress. Smith is widely known for her roles as National Security Advisor Nancy McNally in The West Wing and as Hospital Administrator Gloria Akalitus in the Showtime series Nurse Jackie. She is a recipient of The Dorothy and Lillian Gish Prize (2013), one of the richest prizes in the American arts with a remuneration of $300,000. In 2009 Smith published her first book, Talk to Me: Travels in Media and Politics. In 2006 she released another, Letters to a Young Artist: Straight-up Advice on Making a Life in the Arts-For Actors, Performers, Writers, and Artists of Every Kind. As a dramatist Smith was nominated for the Pulitzer Prize for Drama in 1993 for Fires in the Mirror which won her a Drama Desk Award for Outstanding One-Person Show. She was nominated for two Tony Awards in 1994 for Twilight: one for Best Actress and another for Best Play. The play won her a Drama Desk Award for Outstanding Solo Performance and a Theatre World Award. Smith was one of the 1996 recipients of the MacArthur Fellowship, often referred to as the "genius grant." She also won a 2006 Fletcher Foundation Fellowship for her contribution to civil rights issues as well as a 2008 Matrix Award from the New York Women in Communications, Inc. In 2009 she won a Fellow Award in Theater Arts from United States Artists. She has received honorary degrees from Spelman College, Arcadia University, Bates College, Smith College, Skidmore College, Macalester College, Occidental College, Pratt Institute, Holy Cross College,[disambiguation needed] Haverford College, Wesleyan University, School of Visual Arts, Northwestern University, Colgate University, California State University Sacramento, University of North Carolina at Chapel Hill, Wheelock College, Williams College, and the Cooper Union. The United Solo Theatre Festival board awarded her with uAward for outstanding solo performer during the inaugural edition in November 2010. In 2013, she received the 2012 National Humanities Medal from President Barack Obama.